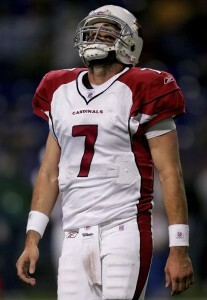 Matt Leinart's days in Arizona are officially over. I have to be completely honest. I never saw this coming. I had Matt Leinart starting all the way. As the off-season wore on, however, it became increasingly clear that Leinart was not going to be able to lead this team. Despite what was becoming plain to see, I still couldn’t admit to myself that Leinart wasn’t panning out. Not at all because I especially liked Leinart or because I thought he was especially talented. Maybe, however, it was due to the fact that his pre-season numbers weren’t so bad. Maybe it was that Derek Anderson didn’t seem like a great alternative. Maybe I just didn’t want to see the Cardinals embroiled in a quarterback controversy. Whatever the reason, it seems like moot point now; Leinart’s gone. Leinart appeared to have become a distraction. Coach Whisenhunt seems to have picked up on that as well, which seems to be the reason why Leinart was ultimately released. Whisenhunt admitted that “this process was not about two weeks into camp or two preseason games. 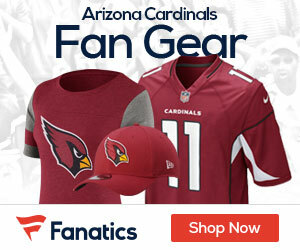 It was a complete body of work over a period of time.” In short, the Cardinals appeared to have run short on patience with Leinart’s attitude. So with the attitude problems hopefully gone, I’m anxious to move on and look forward to the coming season,which is closer than ever. Derek Anderson has looked pretty impressive in the third and fourth week of the pre-season and the team certainly seems to have responded to the switch. I’m looking forward to the season opener against the Rams. I’m excited about this team’s chances and I’m looking forward to Derek Anderson hopefully bringing the team its third consecutive division title. RB Alfonso Smith and LB Chris Johnson were the last two cuts, which brings the Cardinals roster down to the required 53 players.